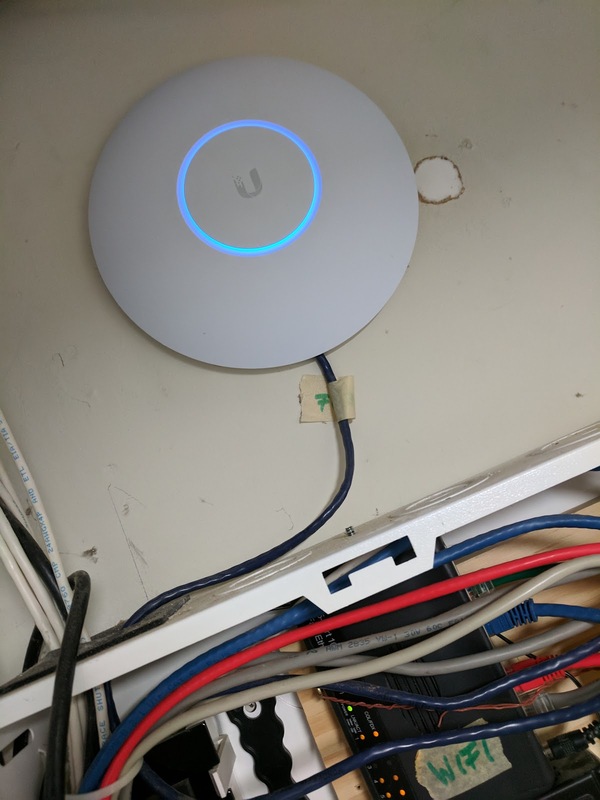 My Unifi AP-PRO died last weekend with a whimper (*). I liked the relative uneventfulness of the AP-PRO deployment, so while my RMA request made it through Ubiquiti's Support department, I ordered a AP-AC-PRO, which arrived today. Plugged in and configured within a couple minutes, it just worked. ... well, except for my MacBook Pro, ... and only in the living room. Despite the MacBook Pro showing strong wireless signal, a ping to the default gateway got 100% packet loss. What the heck? Walking around the house, the Wifi signal as reported by the Mac was consistently strong, but as soon as I walk into the living room I get 100% packet loss, while maintaining that strong Wifi signal. I had occasional episodes of this behavior with the AP-PRO before. However, with the AP-AC-PRO it's reproducible 100% of the time. After reading lots and lots of MacBook Pro vs. Unifi AP horror stories from 2 to 5 years ago in various forums, the one advice that helped was to consider 2.4GHz interference, channel changes, and the MacBook Pro radio backing off too much. I created a 5GHz-only Wifi network on the Unifi controller for the MacBook Pro to use. The result: Strong Wifi on the MacBook Pro with no packet loss anywhere in the house. Next, I'm planning to experiment with the band steering feature on the AP-AC-PRO. Maybe that will make the second SSID unnecessary. (*) It turned out that the POE injector is bad, while the AP-PRO is just fine. A replacement POE injector should arrive tomorrow.